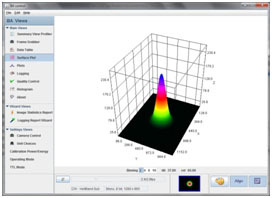 The Beam Analyzer (BA-CAM) Laser Beam Profiling system and software enables “real-time” laser beam measurement, analysis and monitoring of CW and pulsed lasers. The system design is based on the international standards ISO 11146 and ISO 13694 which relate to lasers and laser related equipment and laser beam spatial metrics. The Laser Beam Profiling system is modular in design and can be configured for most applications and laser wavelengths. The design contains no “moving components” and provides instantaneous measurements and analysis of the laser beam and all active optical elements. 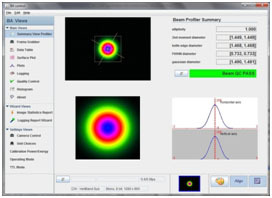 The Beam Analyzer Camera provides “Real-Time” viewing of spatial distribution, measurement, analysis and monitoring of laser power, beam diameter, beam ovality, beam center and beam centroid. When used in a beam delivery system, the BA-CAM can sample the unfocused laser beam (via beam splitter or 99.5% reflective mirror) prior to a focus lens. The BA-CAM can monitor the laser beam for degradation, stability, power, alignment and tuning. A beam reduction optic is required for laser beams larger than 5 mm in diameter. 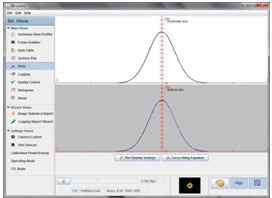 Haas Laser Technologies offers a wide array of attenuation options and pick off optics for monitoring a laser beam profile in a real time environment. Sensor: CMOS Chip, 2/3" with optional 1"